She discovers that the murderous boy-king is not all that he seems and neither are the deaths of so many girls. Shazi is determined to uncover the reason for the murders and to break the cycle for once and for all. The synopsis of this book had intrigued me beyond belief, and I literally couldn't wait to dive into it. 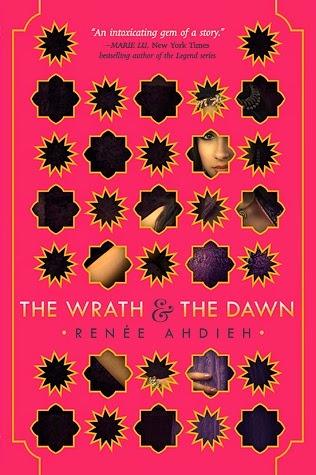 The cover and theme of this book seemed to take place in an Arabian-esque setting. The thing that really captured me about this book was the synopsis, which was completely terrifying but arousing at the same time. After finishing this book, I'm literally speechless at the moment to the point of which I can't even comprehend. There are tears, yes, tears. So without further ado, here is my review for this glorious book. Rachel from A Perfect Called Books wrote a review on this book even before I got my hands on it and got me going crazy about reading it! Check her review here! It's awesome, just check it out because it'll give you the feels. At each night, the mysterious Caliph of Khorason takes on a new bride only to have her killed at dawn, with a single silk cord wound around her neck. The happenings of this strange ruler and an enigma to everyone and especially to the family of the bride. Of course, everyone has growing suspicious when a brave girl, Shahrzad, volunteers to be his next wife. What they don't know is that Shahrzad has a growing and burning plot for revenge and justice awaiting in the deepest parts of her mind. The story, the plot, the twists and turns, it was all so freaking beautiful! Let me tell you that this book, along with others like The Book Thief and Jane Austen, was exquisitely written, with a voice that I thought was so strongly opinionated and riled up with emotions. Ahdieh's voice is a mix of broken, tortured, and innocent, all at the same time. I loved the parts in which she was vulnerable along with those of dark and secretive motives. Beautiful, extraordinary, splendid! She's able to alternate voices and tones so easily, even though this is just a debut novel. Not only will the story make you cry, it'll make you laugh, blow steam out of your ears, and blush! First before I talk about out main protagonist, Shahrzad, I want to talk about the Caliph of Khorason, Khalid, who may seem pretty strange to you guys if you've read the synopsis. Most people know him as the "monster that killed many girls without reason" or a "young boy-king that doesn't understand the duties of a ruler" but behind the facade that he puts on to his noblemen, guards, and his people, he's just a young king looking for a way out of a terrible predicament. I liked Khalid's character- a mysterious yet brooding young man that was totally being misunderstand by people. Basically, there was so much more beneath Khalid's character than what everybody saw. Shahrzad was like the bravest main protagonist in YA history! Not only did she risk her life to save her brother, but she risked her life by loving the Caliph of Khorason!! A cunning character who asks fast on instinct and doesn't show fear when things come unexpectedly. Lovers of Katniss, Tris, and Laia from An Ember in the Ashes will love the new character Shazi! Romance is a blossoming flower in this novel. Shazi's relationship with Khalid in the beginning is full of resent and hatred. It isn't until she stays with the Caliph for about a week, does she begin to realize his true intentions for killing off these poor, innocent girls and for being a monster. She, instead, feels sorry for him and begins to fall in love with him herself. It's an epic love story that evolves from beginning to end and doesn't stop surprising you. A romance with a little bit of action at every turn is truly favorable. Love was a huge weakness for both Khalid and Shazi. Shazi was supposed to die on the first sunrise but Khalid's curiosity with her made him weak and so she survived the first sunrise. Ohh believe me when I tell you this... Khalid fell, and he fell hard! Love always prevails, and I particularly liked how it was shown in this book. If you're one for sappy and growing romances, this book will satisfy every bit of your needs. Care to fangirl with me about The Wrath and the Dawn?